DianeA -- The health care of 422,000 Virginians is on the line. As Republicans in Congress move forward with repealing the Affordable Care Act, Virginians are fighting back. 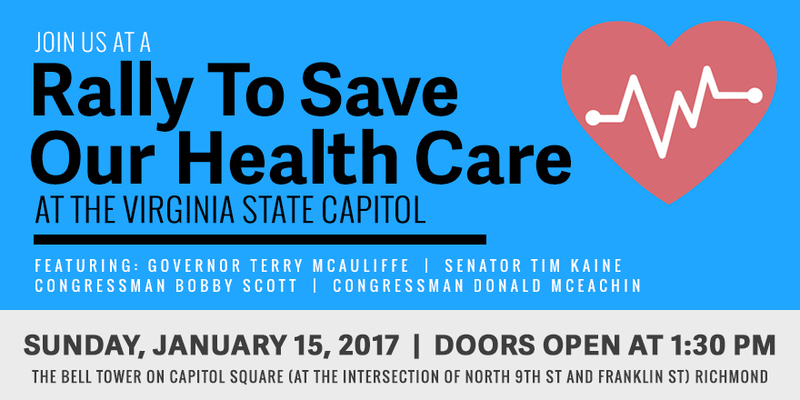 Tim is joining Governor McAuliffe and allies in Richmond at The Bell Tower on Capitol Square next Sunday to send a powerful message to Washington: You can’t take our health care! But our message will only be as strong as the folks behind it. That’s why we’re asking you to join Tim in Richmond on the 15th at a rally to save our health care. Can you make it? Please RSVP here.